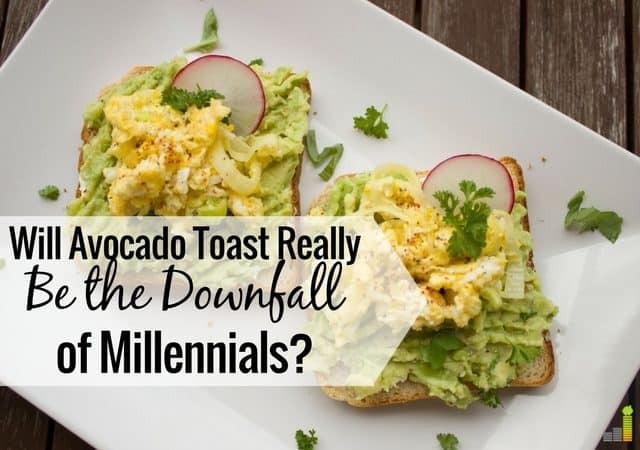 Will Avocado Toast Really Be the Downfall of Millennials? Wow, you just never know when you’re going to be the next viral story online. 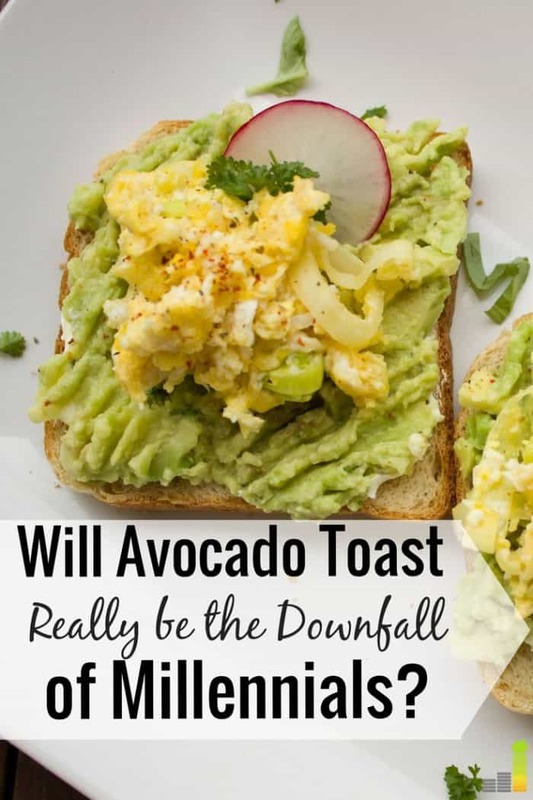 Unfortunately, for real estate mogul Tim Gurner, the Internet had a field day with a comment he made about Millennials, their expensive taste in avocado toast, and how all of this might translate into an inability to buy a house someday. This comment literally had the New York Times doing research on the price of avocados ($1.25 for one avocado during the month of March, in case you’re interested.) Millennials got offended on Twitter. It was a whole thing. Given that I’m a Millennial homeowner and a financial writer by trade, I figured it’s as good of a time as any to weigh in. I guess people really love their avocado toast because to me, Gurner’s comment on 60 minutes was no different than saying, “Stop drinking Starbucks lattes.” In fact, he does mention $4 coffees after the bit about avocados, but the Internet didn’t hear that part. The thing is, we all know that Starbucks drinks costs a lot more than making a cup of coffee at home. Millennials like convenience. Millennials like experiences. Research shows all of this, so it’s nothing new. What made Gurner’s comments stand out, I think, is that he attached it to something people feel very passionately about: home ownership. Home ownerships is, and might always be, the ultimate dream for many people. Ask anyone on the street what the American Dream is, and most of them will tell you it’s owning your own home with a white picket fence. Gurner hit a nerve. He wasn’t telling Millennials that a Starbucks coffee will prevent you from paying down your student loan debt like so many financial experts do. He gave a little extra emphasis by saying, Hey Millennials, stop eating out with your fancy avocado toast or you might not own a home. Like, ever. I honestly think his comments scared people because as previously mentioned, owning a home is a goal that many Millennials have. He talked about the economy, about the growing value of homes and about the eventual transfer of wealth from the Baby Boomer generation. It was actually a really interesting conversation. I’ve never heard of Gurner before this, but now I’m interested in learning more about him. After all, he’s a 35-year-old and worth almost half a billion dollars. Maybe we should listen to his advice? I think Gurner was actually coming from a place of concern. He has experience owning properties and a deep understanding of how prices change and increase over time. He’s looking around at his own generation and noticing that many young people want the finer things in life but perhaps aren’t doing what it takes to get there for the long-haul. I know from my own humble experience buying a small 1,000 sq. ft. home at age 29 with my husband that it takes a lot of hard work to buy a home. My husband only had a signed work contract to show a mortgage company, and I was a risky bet for them since I was an entrepreneur. I had to show our lender every single profit and loss statement from the last three years of my business and explain every drop in income, like how my business was slow during my maternity leave. Buying a home requires a lot of effort and a lot of savings. If you take one look at my social media accounts, you’ll know that I frequent Starbucks since I like to write in there, so I’m not morally opposed to expensive coffee – or expensive avocado toast. The reason for that is the fact that I’m a hard working Millennial who makes a solid income. I also track my spending. I know when it’s okay to spend and when it’s time to pull back. So, my next piece of advice is to have a plan. Gurner’s comments were hinting at this as well. It’s not enough to go through life without having a concrete idea of how you’re going to reach your big goals. Sometimes little purchases do affect big ones, so if you’re in the market to buy a house in a year or two, you probably know that you’ll have to start tightening your budget to build up cash to save for your first home. Also, finance is mostly about behavior. So, if you do notice money habits that are making you broke like shopping a lot when you’re bored or sad, maybe it’s time to make an adjustment. If you notice that you’re always surprised when you get your bank statements at the end of the month, maybe it’s time to start tracking your spending week by week. Compare your money habits to your big goals. Are your daily money habits going to help or hinder your ability to reach them? It’s time to think about it. Nothing more. Nothing less. Also, you should buy your avocados at Aldi. They’re pretty cheap there. What did you think of Gurner’s interview? Do you think the Internet is justified in their non-stop viral reporting of this story? How do you balance spending on things you want without impacting your long-term goals? From what I’ve read, the other part of the backlash toward his comment is a reaction to the real estate prices in Australia, where this controversy originated. Sydney = San Francisco, if not higher. Many young people commented that there’s no way that just cutting back on small luxuries would never allow them to buy a home bc real estate prices are so exorbitant. I think the same could be said here in the US, except toward school loans. Yes that’s what I gathered from the interview too, that Australia real estate prices are sky rocketing. Yeah, it really depends on the individual. One small treat here and there won’t sink you but eating out 4x a week could make a difference in saving up a down payment for a house. It’s just so funny to me that everyone honed in on the avacado toast lol. I heard about this of course but haven’t really given it much time/energy/attention. Home ownership is such a complex topic that I do think it’s shortsighted to attach any one spending habit towards having the ability to own a home. I think the interview’s impact is blown out of proportion. While the main idea is correct and I do agree that irresponsible spending leads to financial difficulties, it’s actually an age-old concept. Personal finance bloggers have been talking about “the Starbucks latte” for years, so there’s really nothing new about it.